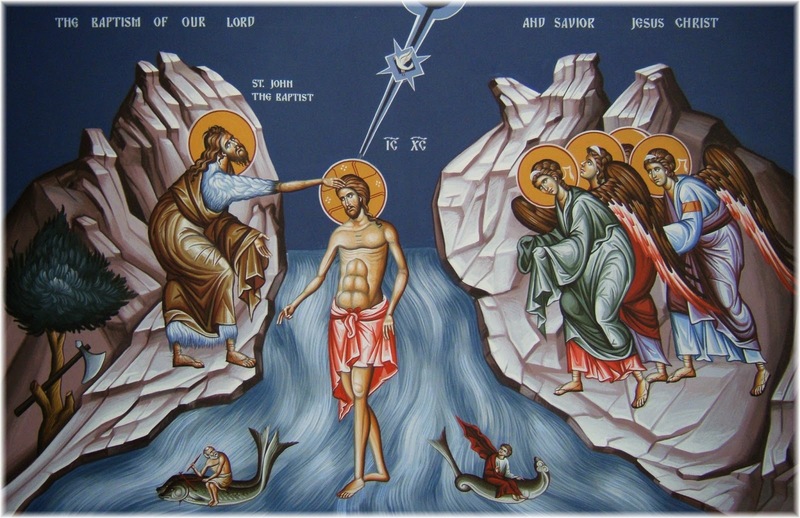 "He was born and baptized, that by His passion He might purify the water." for the voice of the Father bore witness to Thee, calling Thee His beloved Son. And the Spirit in the form of a dove confirmed the truth of His word. O Christ our God, Who hath appeared and enlightened the world, glory to Thee. On this day Thou hast appeared unto the whole world, and Thy light, O Sovereign Lord, is signed on us who sing Thy praise and chant with knowledge: Thou hast now come, Thou hast appeared, O Thou Light unapproachable. Today the grace of the Holy Spirit hath descended on the waters in the likeness of a dove. Today has shone the Sun that setteth not, and the world is lighted by the light of the Lord. Today the moon shineth with the world in its radiating beams. Today the shining stars adorn the universe with the splendor of their radiance. Today the clouds from heaven moisten mankind with showers of justice. Today the Uncreated One accepteth of His own will the laying on of hands by His own creation. Today the Prophet and Forerunner draweth nigh to the Master, and halteth in trembling when he witnesseth the condescension of God towards us. Today the waters of the Jordan are changed into healing by the presence of the Lord. Today the whole universe is watered by mystical streams. Today the sins of mankind are blotted out by the waters of the Jordan. Today hath paradise been opened to mankind, and the Sun of righteousness hath shone for us. Today the bitter water is changed at the hands of Moses to sweetness by the presence of the Lord. Today are we delivered from the ancient mourning, and like a new Israel we have been saved. Today we have escaped from darkness and, by the light of the knowledge of God, we have been illuminated. Today the darkness of the world vanisheth with the appearance of our God. Today the whole creation is lighted from on high. Today error is annulled, and the coming of the Lord prepares for us a way of salvation. Today the celestials celebrate with the terrestrials, and the terrestrials commune with the celestials. 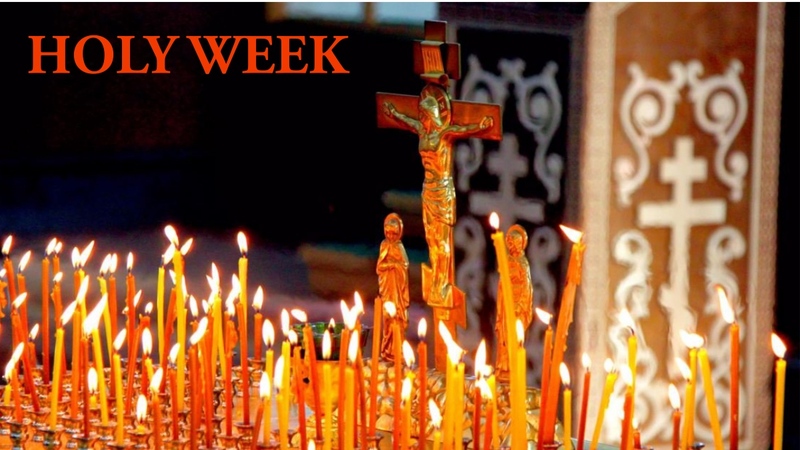 Today the assembly of noble and great-voiced Orthodoxy rejoiceth. Today the Lord comes to baptism to elevate mankind above. Today the Unbowable bows to His servant to deliver us from slavery. Today we have bought the kingdom of heaven, for the kingdom of heaven has no end. Today the land and the sea have divided between them the joy of the world, and the world hath been filled with rejoicing. 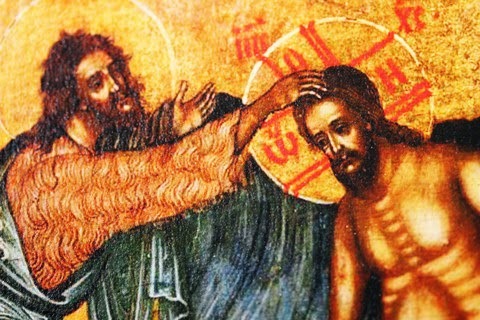 Because baptism is not just the recognition of God, but also a promise to turn back to Him and to do works that please Him, that is why Christ’s Forerunner and Baptist did not merely guide people towards acknowledging Christ, but also preached repentance and sought fruits worthy of repentance: righteousness, almsgiving, moderation, love and truth.